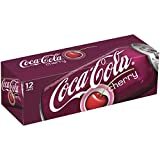 Cherry Coke is the most popular flavor variation of Coca Cola. It has the same caffeine content as regular coke but with a distinctive cherry flavor. 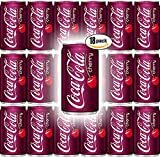 Cherry Coke also come in Diet and Zero versions, which are zero calorie but all have the same caffeine content. Carbonated water, sugar, color (caramel E150d), phosphoric acid, natural flavorings including caffeine. 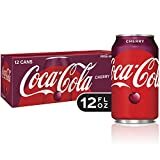 Cherry Coke contains 2.83 mgs of caffeine per fluid ounce (9.58mg/100 ml).